No one Expects the Belgian Inquisition! hat tip: grayp on Little Green Footballs. ... the Belgian judiciary decided that the priest will have to stand trial before the penal court in Charleroi. He reacted by repeating his time bomb statement and added that he would be honoured if he had to go to jail for speaking his mind. Father Samuel knows of what hew speaks: "he was born 1942 in Midyat, Turkey, as Samuel Ozdem" and later "fled to Belgium, claiming that the Aramaic Christians were being persecuted in Turkey". Simply amazing prosecution on the part of the Belgians for something far less inflamatory than has been said by Muslims in Belgium. The leader of the Belgium-based Arab- European League (AEL), Dyab Abou Jahjah, has condemned the double standards of the West regarding freedom of speech as far as Muslims are concerned… “Muslims and others in Europe cannot say everything they often want to say and they risk being arrested and prosecuted if they do. “Muslims and other religious people cannot express their disgust from homosexuality and clearly state that they believe it’s a sickness and a deviation without being persecuted for being homophobic. “Yes Arabs and Muslims are uptight when you touch their religious and national symbols, but Europe had made of political correctness and the cult of the holocaust and Jew worshiping its alternative religion,” he went on to say. One wonders if Abou Jahjah was prosecuted for this speech. A 29-year-old Detroit man who pleaded guilty Nov. 22 to threatening to blow up the federal courthouse in Detroit to avoid meeting with his probation officer was sentenced Wednesday to 87 months in prison. Russell made three bomb threats in July and August 2004 while on supervised release from a 2-year prison sentence for cashing $93,243 in stolen DaimlerChrysler checks in 1998-99. So who did Harvard get? Richard Shaw, Yale's dean of undergraduate admissions until he took the same post at Stanford last year, told the New York Times that Yale had another foreigner of Mr. Hashemi's caliber apply but "we lost him to Harvard" and "I didn't want that to happen again." Mr. Shaw won't return phone calls now, but emails he's exchanged with others offer insights into his thinking. . . .
Ok, its bad enough and an amazing showing of a lack of critical thinking skills among academia that Yale took in "Mr. Taliban" as a special student. But, the interesting question is who was the other "foreigner of Mr. Hashemi's caliber" that Yale lost to Harvard? 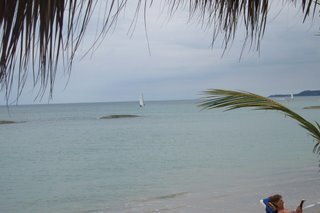 Scuba show cancelled but the Scuba lessons must go on! The North American Shipwreck and Dive Show set for saturday the 18th here in Michigan was cancelled. Of course I didn't hear about the cancellation and went to the facility and saw the sign that it was cancelled. Unfazzed, I went on my merry way to Sea The World Scuba Center, a scuba shop that was going to be exhibitng at the show and also having a presenter on some amazing dive trips. I entered the store to a party like atmosphere - food and drink, and very helpful staff. They were offering a show cancellation special on their open Water certification and after talking with them I signed right up. I also bought the basics there- boots, fins, mask and snorkel, and a gear bag to carry it all in. 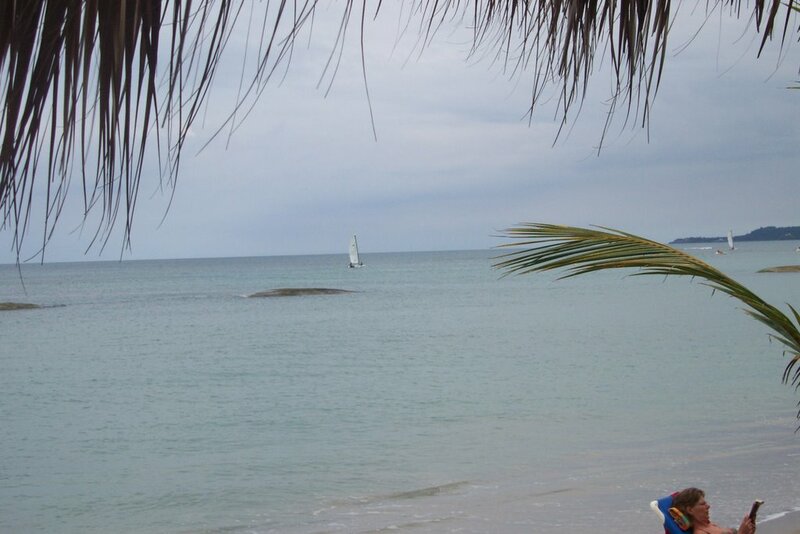 The staff were very helpful in outfitting this complete Scuba newbie. The presenter had some very interesting DVDs showing amazing dive trips to exotic locales like Truk, with its plethora of Japanese WWII ships resting on the bottom, and carribeamn locations with many amazing fish. I'm looking forward to the lessons and getting certified and will post about the experience as it goes. A bipartisan bill has been introduced in Michigan to ban protests within 500 feet of a funeral. Twice in one week protesters from Westboro Baptist Church came to Genesee County. They stood on American flags while holding signs condemning soldiers, the country and homosexuality at the funerals for Pfc. Allan Morr, 21, of Byron, on March 6 and for Sgt. Joshua Youmans, 26, of Flushing Township, on March 11. Of course far more decent people show up to block these contemptible idiots from view of the mourning families. Hundreds of people showed up at Youmans' funeral to support the family and shield funeral-goers from seeing and hearing the protesters. Sadly, none of these protestors seem to have gotten their butts kicked back to Topeka, and given thier actions seem to fit the very definition of the fighting words doctrine, I'm amazed at the restraint of the decent people at the funerals who do not indicate their displeasure in a physical form. The American Civil Liberties Union has no objection to the proposals as they've been outlined so far, said Flint attorney Gregory T. Gibbs, of the Flint-area ACLU. Good on the ACLU for being on the side of right this time. Which is today. Try to avoid attending meetings with people who may have it in for you today, ok? On the Ides of March in 44 BCE, Julius Caesar was assassinated. This silver denarius, with a portrait of Julius Caesar was struck in 44 BCE prior to his death. P Sepullius was the moneyer who struck the coin. 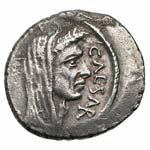 On the Obverse: CAESAR [DICT PERPET]VO Head of Caesar wreathed and veiled facing right. 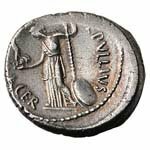 On the Reverse: [P S]EPVLLIVS [M]ACER Venus standing left holding Victory and scepter, shield on ground behind her. The coin is in EF/gVF condition and currently on sale in Harlan J. Berk's Bid or Buy sale. This coin and others depicting Caesar were the first Roman coins to depict living rulers rather than honoring ancestors or the roman deities. This was likely one of the many irritants and impetuses for the assassination, yet another sign that Caesar was intending to end the old ways of the Republic and instead be installed not just as a perpetual dictator but as a Tyrant. Voters in Justice Souter's hometown in New Hampshire have rejected a proposal to condemn his house and turn it into a hotel. The taking was proposed by the group Natural-rights.org after the Supreme Court ruling in Kelo v New London, 125 S. Ct. 2655 (2005). (AP) - WEARE, N.H.-In a largely symbolic gesture, voters in Supreme Court Justice David Souter's hometown on Tuesday rejected a proposal to seize his 200-year-old farmhouse as payback for a ruling that expanded government's authority to take property. Originally, the ballot measure called for the seizure of Souter's home so that it could be turned into an inn called the Lost Liberty Hotel. But at a town meeting in February, residents of this town of 8,500 watered down the language. Voters decided 1,167 to 493 in favor of the reworded measure that asked the Board of Selectmen not to use their power of eminent domain to take the farmhouse, and instead urged New Hampshire to adopt a law that forbids seizures of the sort sanctioned by the Supreme Court. "It makes Souter the only person in the United States that would be given special protection against his own ruling," said Logan Darrow Clements of Los Angeles, a businessman who led the campaign to evict Souter. 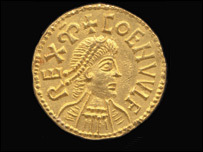 The British Museum just added to their collection by purchasing a gold coin of King Coenwulf of Mercia for £350,000. A metal detector enthusiast found it next to the River Ivel in Bedfordshire in 2001, and it was later bought by a US collector. When the owner put it up for sale last year, the Government put a temporary export ban in place hoping it would be saved for the nation. It is one of eight known gold coins - of which the museum now owns seven - which date back to the mid to late Saxon period. Hat Tip: London News and Things of Muse. 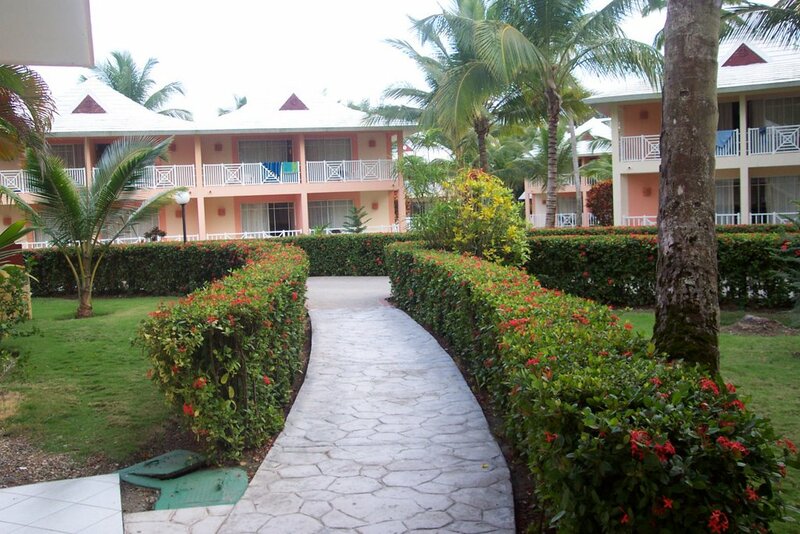 Ok, finally here's some pictures of the Bahia Principe Resort where we stayed in Puerto Plata. Here's a view leading to one of the resort's 3 story villas (each villa has about 4 or 5 guestrooms on each floor). Oh, did I mention it rained a lot? 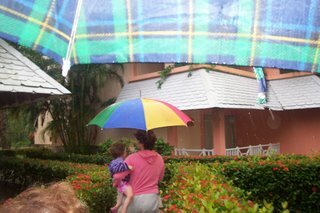 All in all a fantastic time and a great resort. Certainly the sunny pics will helpd us get through the remains of this year's Michigan winter.